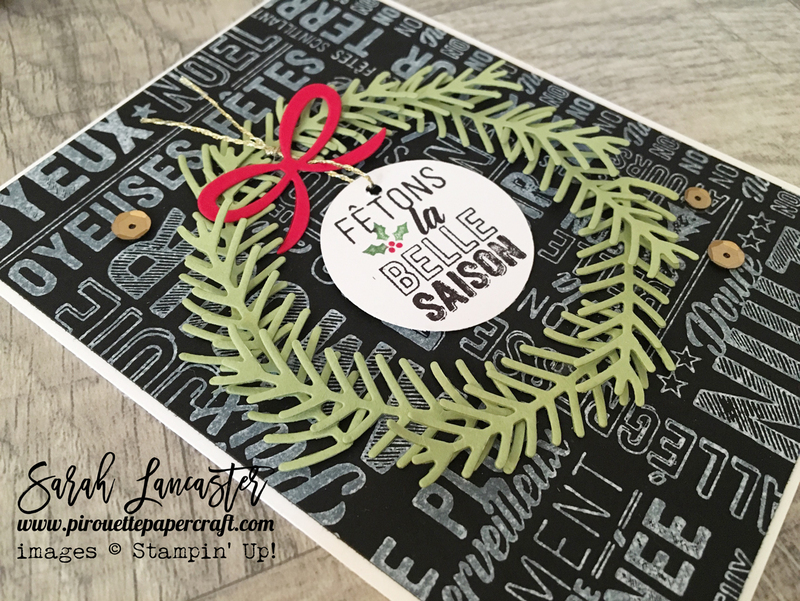 Today I am here with some beautiful creations using the Merry Medley background stamp from Stampin' Up! with a twist - I am using the French version called Joie à profusion. 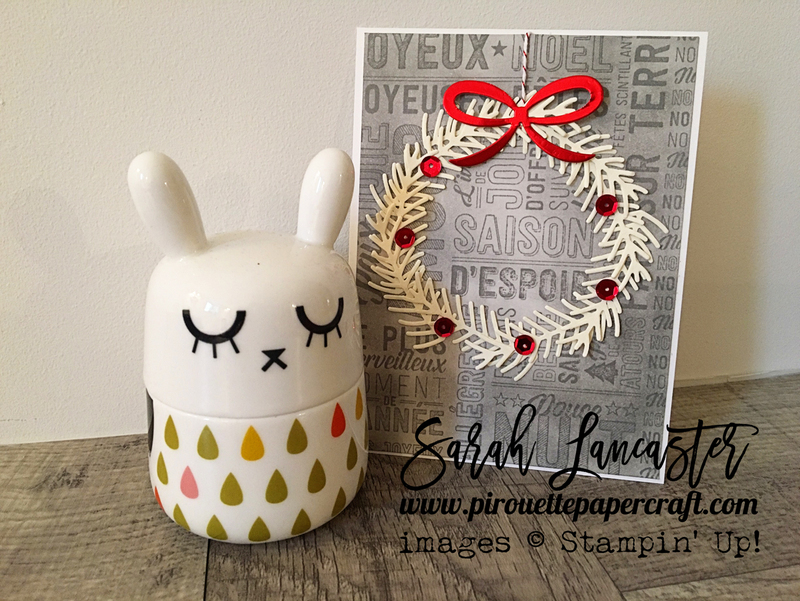 For my first card I have CASEd the amazing card shown in the Autumn:Winter catalogue. The wreath is created using the Pretty Pines dies. The sentiment comes from the Merry Medley stamp - I picked out and stamped the words and holly sprig using my Stampin' Write markers and then used my circle punch to create the little tag. Don't overlook the Merry Medley | Joie à profusion stamp set for your Christmas crafting ! It's great for backgrounds but remember to you can pick out the individual sentiments to use on projects too ! 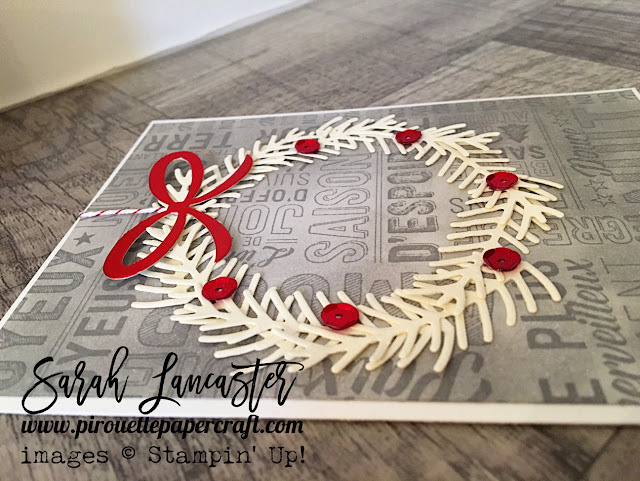 Would you like to become a Demonstrator, earn discounts and reward and get to craft with Stampin' Up! products before their release ? If so click here to join my team - more information here. 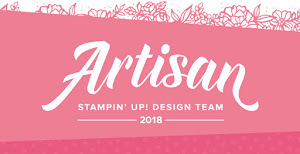 If you would like to place an order I would be delighted if you'd visit my online store at www.pirouette.stampinup.net. You pay in your local currency determined when you set up your Online account (i.e. £ for the United Kingdom, € for France, Germany, Austria and Holland) Please show your support by using the current Hostess Code shown at the top right of this blog and a crafty thank you gift will follow in the post from me. Your Stampin' Up! goodies are shipped direct to you from Germany via UPS (no custom duties incurred) and normally arrive within 3 to 5 working days after ordering. 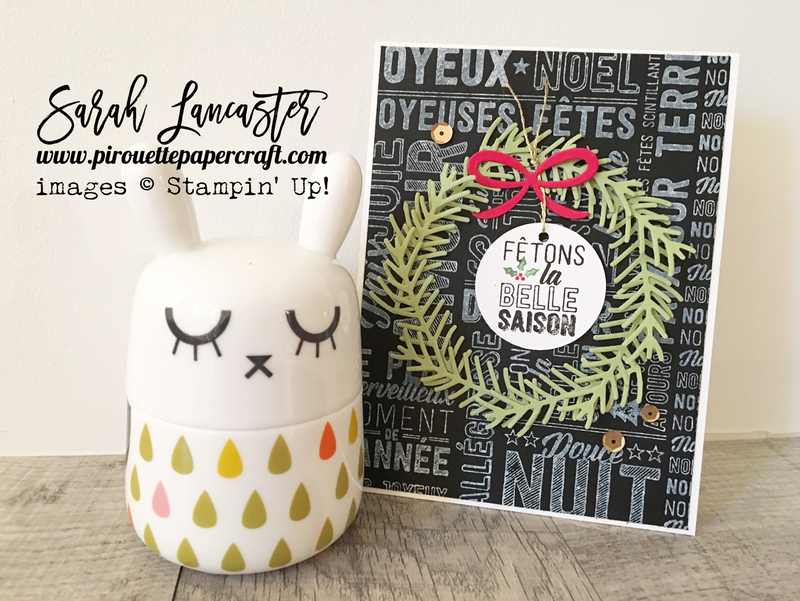 Happy Halloween with Stampin' Up! More Cookie Cutter Christmas from Stampin' Up! © 2015 pirouette : Sarah Lancaster. Felicity Template designed by Georgia Lou Studios All rights reserved.